My fondness for nature writing does not abate. I put it down in part to the horrors of suburban existence – commuting, work, a feeling of disconnectedness with the land – and I’m certainly not alone: today’s nature writers are amongst the biggest successes in recent publishing, and it’s not unusual for me to find myself heading straight to the nature section in my local bookshop. It is, however, often difficult to discern what’s worth reading, and what’s simply joining on the bandwagon in such a burgeoning market, but two books stand out for me. 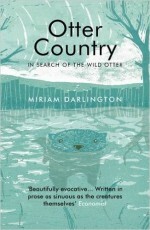 Miriam Darlington’s Otter Country: In Search of the Wild Otter is a story of the author’s obsession with otters. Anyone who has holidayed in otter country will know their draw. Pawprints on beaches… could they be that elusive animal? More likely a dog. But otters are embedded deep within our consciousness and they serve as a totem for the state of the environment. Being at the top of the food chain, otters are particularly susceptible to the ravages of industrial and agricultural pollutants on river life, and they have suffered, too, by the prevalence of non-native species such as mink. The car is one of their greatest killers, particularly of their young. Darlington follows the otter across England, Scotland and Wales; her journey takes her to Cornwall and Northumberland, Cardiff and the East End of London; indeed, this is as much an evocatively told journey into the diversity of landscapes where otters dwell and her personal odyssey, her moments of exhaustion, frustration and illness, her days spent sick and weary in the depths of February. Like much modern nature writing, however, the journeys are as much imaginative and take the reader into other nature writing. At Sandaig and Glen Elg in the north west Scottish Highlands she searches for the otter in the place where Gavin Maxwell, author of Ring of Brightwater, lived with his rescued otters, including the famous Mij. In Devon, she traces the course of the Dart from its tidal estuary, through wooded glade and onto the wilderness of Dartmoor, searching first for otter spaint, the surest sign of their presence. Moving north over the watershed into the north of Devon, she explores ‘Tarka Country’ where Henry Williams lived and wrote Tarka the Otter, the childhood book which more than any other fashioned her obsession, and shaped, too, the imagination of Ted Hughes. An obsession with the hare, that mysterious creature of fable and myth, drives Jim Crumley’s Hare: Encounters in the Wild. Crumley, too, finds other writing, taking us to Robert Burns and his sentimental (in the historic sense of the word) ‘On Seeing a Wounded Hare’. But this is a much shorter work than Otter Country, attractively presented in hardback format (though the £10 price tag seems a little steep) and based much more on protracted close observation. Crumley notices intricacies of behaviour, minutiae of appearance and details of habitat. Hares, we learn, are not only brown, but a carpet of different shades, camouflaging them more often than not. Indeed, for an animal whose speed is its famous characteristic, it is their ability to remain still which often foils their predators, whether badger when young or golden eagle. Where Darlington travels the length and breadth of these isles, Crumley is more focused on Scotland, visiting places he knows well, whether the fields of West Lothian, the beaches of Skye or Flanders Moss in the upper reaches of the Forth. And yet the writing is also familiar territory, of the future of a species in jeopardy and our ecosystem under threat. For we learn of the hare’s demise, even in the wildest of places, still all too often persecuted on shooting estates, where it is held to compete for food with much more profitable game such as grouse. While jugged hare is no longer common fare for Brits, Italians it turns out are not averse to returning home with vanloads of the poor creatures. Yet perhaps what stands out is Crumley’s sense of awe and wonder. In Strathmore and the Sidlaw hills, not far from his native Dundee, he enters ‘the land of the two hares’, where in deep winter the common hare and the mountain hare (a species confined to Scotland and the Peak District) meet, as the mountain hare, transformed to its white winter coat, descends to lower slopes in search of food.